For decades in the comics industry, the winter has often earned the monicker "Dead Quarter" — not so much for sales, which have often been strong, but because publishers, anticipating bad weather, simply don't release much into the market. That dynamic, combined with DC's stated plans to reduce its new comics offerings by 10-15% over the past year, has seriously reduced new offerings in three of the last four months. November had the smallest new release slate for comic books since before DC's Rebirth; December, truncated by the holidays, had even fewer new releases, and the smallest DC periodical slate since 1991. After a rebound in January, February 2019 returned to the trend, with the smallest number of new comics releases since Diamond Comic Distributors began reporting overall figures in July 2013. There were no first issues in the Top 9 at all, indicating few publishers were interested in launching big projects into the month. Sixty fewer new comics were released versus the same month in 2018, a drop of 13%; new comics unit sales were consequently off 8.47% to 5.77 million copies, the lowest figure since May 2011. Dollars were down just 6.06%. Retailers ordered $34.73 million in comics and graphic novels overall, down 5% and the lowest figure since March 2012. 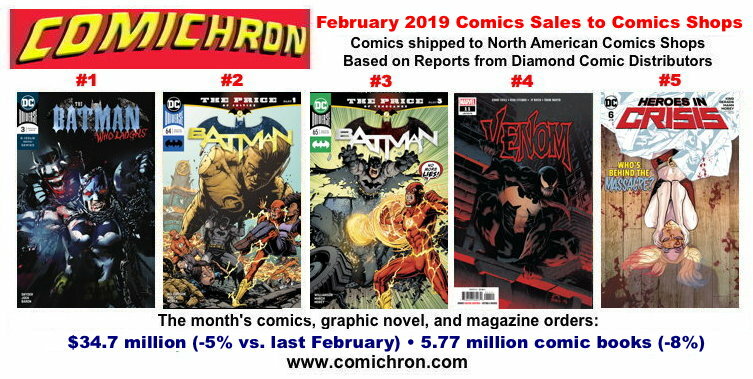 Click to visit our page for February 2019 comics sales estimates; the figures will be posted next week. DC was responsible for nearly half of the drop in the number of new comics periodical offerings: its slate was chopped a full third, from 88 comics last February to 59 this February. Graphic novel new release volume was less severely cut, from 318 new releases last February to 304 this February; there, DC only shipped five fewer graphic novels than in the year before. DC's stated goal in cutting back its offerings was to improve the performances of individual titles; it was at least partially successful in this, with the publisher's overall dollar sales of comics and graphic novels down 15% in a month when the number of new offerings had been cut by twice as much. 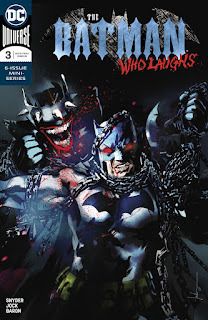 (The market-leading Batman Who Laughs #3 helped that cause.) Image likewise offered many fewer new comics, dropping from 70 last February to 47 last month; its year-to-year drop was similar to DC's. Marvel, meanwhile, grew its slate, with five more comic books and nine more graphic novels released than in the previous February — and it appears to have benefited from it, selling 9% more dollars worth of material versus its performance then. The average new release in February 2019 had orders of 14,830 copies, up from 14,038 in February 2018. That's an increase of 6% in copies ordered per new release; the fact that there were 60 fewer releases is what pulled the market lower overall. There's a "sweet spot" between the number of new releases and sales-per-title for each publisher; finding that is always the trick. So we'll see if there's additional fine-tuning to new-release totals as we head out of what was, for much of North America, a particularly harsh winter. 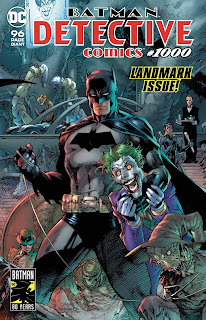 And no matter what else happens, the presence of Detective Comics #1000 in March seems pretty likely to improve DC's average-title sales considerably, just as Action #1000 did last April. The market shares reflect the very lean offerings by the major publishers; the mainstream book channel publisher St. Martin's Press has never made the Top 10 before. We'll have the full estimates along next week. In the meantime, you can find me this weekend appearing at Midsouthcon in Memphis, where I'm toastmaster this year. 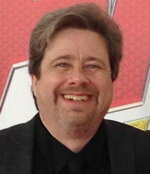 Comichron founder John Jackson Miller has tracked the comics industry for more than 20 years, including a decade editing the industry's retail trade magazine; he is the author of several guides to comics, as well as more than a hundred comic books for various franchises. He is the author of novels including Star Wars: Kenobi, Star Wars: A New Dawn, and the Star Trek: Prey trilogy — and, releasing on July 30, Star Trek: Discovery - The Enterprise War. Read more about them at his fiction site. Twenty-five years ago today, shoplifters struck a comic shop. Spider-Man entered, foiling the crooks — and declaring, after it was all over, "This shopping thing is way too dangerous!" It was a silly bit of advertising copy, included in an eight-page catalog insert that appeared on March 7, 1994 (or March 8, in some stores) in arriving copies of X-Men Adventures Vol. 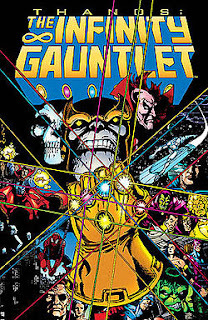 2, #4, a Marvel comic book that tied in with the Fox TV cartoon. It wasn't unusual for a comic book to include a catalog insert; Gold Key had run them in its comics decades before, and Mark Jewelers insert variants are something many collectors of 1970s Marvel comics prize. 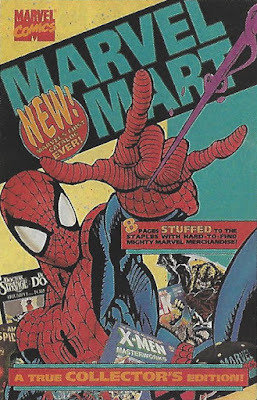 The difference was that this catalog, appearing in a small percentage of Marvel's March-shipping copies, was for its own merchandise outlet, called "Marvel Mart." And with the bubble comics market of the early 1990s just beginning to deflate (as described in my retrospective series here), it immediately became the focus of retailers' anxieties — and, in many cases, fury. Retailers in the period had been fearful of many different kinds of storefront competitors, including Blockbuster Video, which had been rumored to be interested in comics. (Coincidental timing: as of today, that chain is finally down to one location.) Retailer worries surrounding Marvel had often centered on the possibility of Marvel getting into retail itself, with its own chain stores. But Marvel launching its own mail-order merchandise outlet was seen as no less a threat. The internet wasn't a retail competitor, yet, but catalogs were booming, as were TV home shopping channels. Mail-order was a big deal. Retailers objected immediately and vehemently to the whole idea of the mail-order outlet — not to mention Spider-Man declaring that shopping in a comics store was dangerous. But that wasn't all. The inclusion of the catalog in comics they had bought to resell had many retailers feeling that they were being made instruments of their own demise — the catalogs increased the weight of the comics, even, which made shipping more expensive for the distributors. One retailer shipped his Marvel neon sign back to the company with an angry note. Another reported sending (rather melodramatically) a nail, "dipped in the 'blood' of the Direct Market." Diamond Comic Distributors faxed a bulletin to its accounts warning them of the presence of the catalog. "We are extremely disappointed at Marvel's apparent lack of concern for its most viable market: the direct market retailers and distributors who provide a solid financial base for their current business operations." While praising Marvel's other outreach efforts, Diamond said the Marvel Mart program had "serious implications for retailers, distributors, and the entire direct market distributing system." With criticisms mounting, Marvel soon reacted, apologizing for what it called a test-marketed effort from its Corporate Marketing Department. "We did a lot of things badly," said Matt Ragone, Marvel's VP for the Direct Market on March 18. Marvel canceled inclusion of the catalog in further copies. "Marvel takes seriously its mission to bring as many people into the circle of comics and comics merchandise buyers as humanly possible," he said, and the catalog effort was in that spirit — but Marvel put the kibosh on the whole thing. The episode had raised retailer ire, but its longest term effects may have come instead from the anger expressed by another distributor. 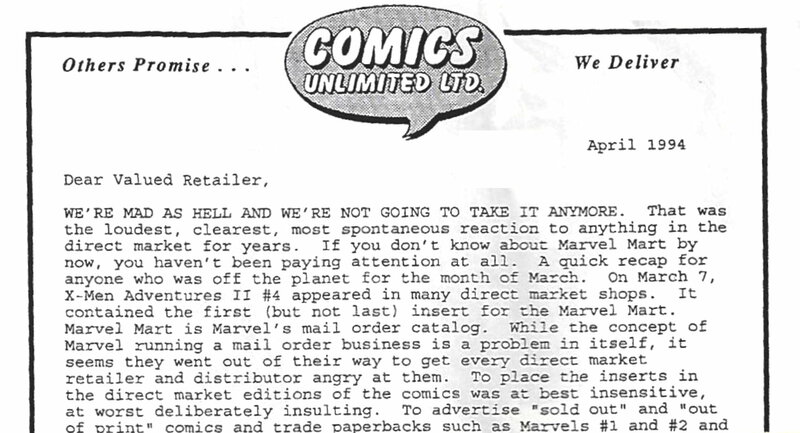 Comics Unlimited, a regional distribution operation, opened its April 1994 newsletter to retailers (part of which is seen at right) with a broadside against Marvel by owner Walter Wang, calling the inclusion of the catalog "at best insensitive, and at worst deliberately insulting" — and while he did not call for a boycott, he advised retailers "to try to reduce the importance of Marvel comics sales in your store" in a number of ways, including promoting other publishers and doing less co-op advertising with Marvel. Marvel strongly objected to such advice coming from a distributor, whose job, ostensibly, was to represent its products favorably. After a series of communications, Marvel discontinued selling comics to Comics Unlimited on May 18, saying later that the fundamental distributor relationship "was severely damaged." Unable to continue without Marvel, Wang sold his company to Diamond on May 29. 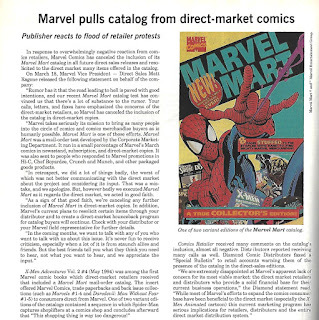 Marvel would leave its relationships with all distributors following its Dec. 28, 1994 purchase of Heroes World Distribution — an event that led to either the collapse or exit of all comics distributors but Diamond from the market. And while that purchase may have been prompted more by other factors — including investor Ronald Perelman's acquisition spree and the speed with which the Direct Market distributors made possible the rise of Image — buzz from behind the scenes has long suggested to me that this first break with a distributor may have set the stage for all the later ones. 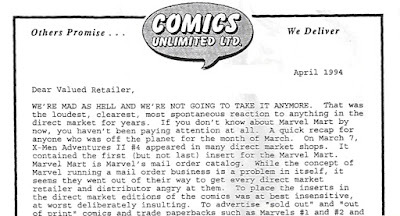 If Comics Unlimited was the first casualty in the Distributor Wars — and in some measure, it was — then Marvel Mart's part in comics history thus looms a bit larger than a simple side-business gone awry. Recriminations were flying at all levels in the crashing comics market of 1994; for a publisher, buying a distributor and going exclusive had the effect of removing one of those levels entirely. In Marvel's case, it worked for exactly 21 months; by the time it returned to open distribution, Diamond was the only player left. Last week's reorders were led by the Jason Aaron Star Wars Omnibus, followed by the Mister Miracle trade — with Batman #65 the top reordered comic book. Umbrella Academy trades ranked highly thanks to the TV show. Click to see reorder activity for February 2019. Martian Manhunter #4 was the top advance-reordered March issue. Click to see reorder activity for March 2019. 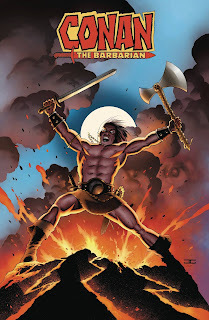 Advance reorders were led by April-shipping War of the Realms #1 and its variants, with the J. Scott Campbell one the most popular. Click to see reorder activity so far for April 2019. DC's He-Man and the Masters of the Universe Omnibus was the top reordered item in dollars last week in comics shops, while Batman Who Laughs #3 was the top reordered comic book. 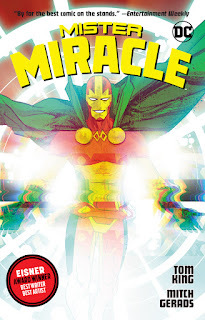 Mister Miracle repeated as the top reordered softcover. Click to see the February charts. Marvel's Incredible Hulk #181 Facsimile Edition was the top advance-reordered comic last week, while a July release, Thanos By Donny Cates, was the top advance reordered graphic novel. Click to see the March charts. 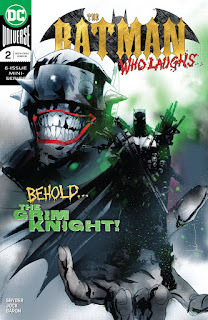 A year after just two comics had sales over 100,000 copies, January 2019 doubled that number, with sales led by Batman Who Laughs #2. 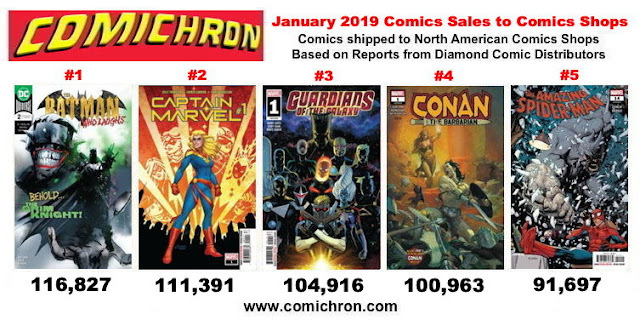 Diamond Comic Distributors shipped nearly 117,000 copies of the comic book to stores in the United States and Canada, with Captain Marvel #1, Guardians of the Galaxy #1, and Conan the Barbarian #1 also reporting sales in six figures. 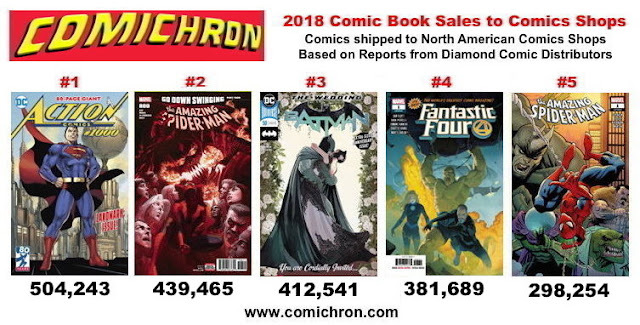 Click to see the comics sales estimates for January 2019. You can also see a video walkthrough of the month's preliminary sales report. The holidays often make the charts for December and January vary greatly from expectations, and the 2018-19 season was no different. After a December that saw Diamond Comic Distributors take Christmas week off and DC release a 28-year-low number of comic books, January came roaring back with healthy-sized slates from major publishers; it was the largest January, in nominal dollars, in the Diamond Exclusive Era. 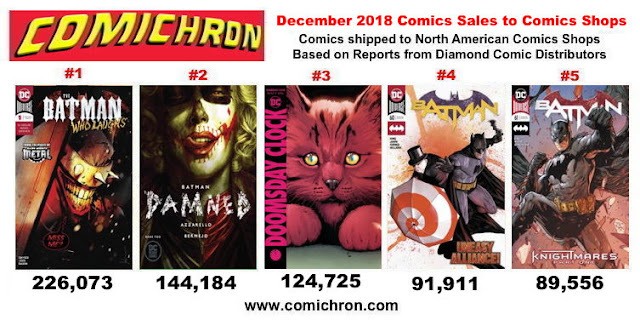 An early look at the sales for the month is below: on Monday, we'll have the full January 2019 comics sales estimates online. The $44.9 million that retailers spent on comics, graphic novels, and magazines in January is more than $5 million more than last January, which also had five shipping weeks; that's an increase of 14%. It even beat out the $43.75 million spent in January 2015, the month of the release of million-copy seller Star Wars #1. 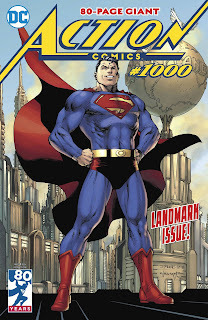 Retailers bought 7.04 million comic books in January 2019, 300,000 more copies than the previous January. That's around the range for the first month of the year for several of the healthier years this decade, though some of those Januaries reached the 7 million mark with one fewer shipping week. As mentioned, December's sales were artificially low because Diamond did not have a full release week during Christmas Week: rather, a handful of select titles had been shipped to stores the Friday before, street-dated for the 26th. While those comics weren't invoiced until Jan. 9, it does appear that the expected dollar value was figured into the December charts, because those Christmas-week releases have normal dollar rankings. 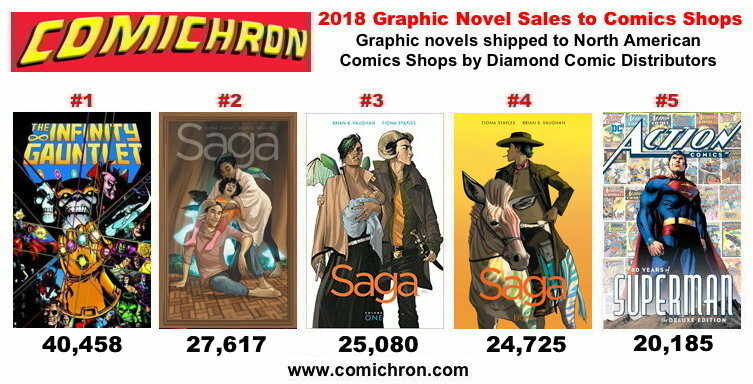 It does appear that significant business that otherwise would have transpired in December occured in January instead; graphic novel shipments were up dramatically, 43% over December dollars and 12% over the previous January's. The asterisk with January 2017 denotes that month's unit sales were artificially inflated by a massive Marvel overship of its entire line. It's worth noting, as well, that this decade, the five-week month only fell in January in this year and last; for the mid 2010s, December got the fifth Wednesday. 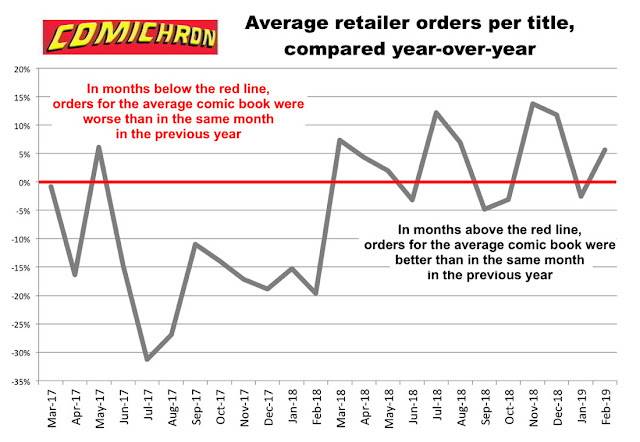 Would the comics market have ended 2018 in positive territory had Christmas Week been a normal week for shipments? It's impossible to tease out what January sales wouldn't have fallen into the first week of 2019 otherwise, but we do know this: if the year ran from December to November, then 2018 would have ended very narrowly up. Among publishers, Marvel bettered its January 2018 dollar orders by a massive 31%; Dark Horse, by an even larger 81%. DC was up very slightly, and Image slightly down. Dark Horse found its way back to the #4 position in dollars, while IDW held that slot in units. 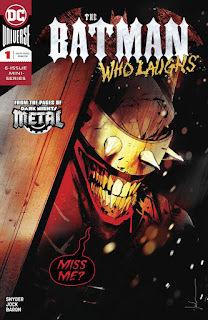 Why did Captain Marvel pass Batman Who Laughs, despite the two comic books having the same cover price? Simple: remember that the dollar charts (just like the market shares) are computed based on the number of dollars Diamond received. The mix of retailers who bought Captain Marvel #1 appear to have done so at a slightly less favorable average discount, meaning they paid more per copy. This happens all the time, and is why there is no simple metric for relating invoiced dollars to retail dollars. In most of these split-decision cases, the two books have order quantities that are pretty similar. The estimated sales for individual issues should be up on Monday.